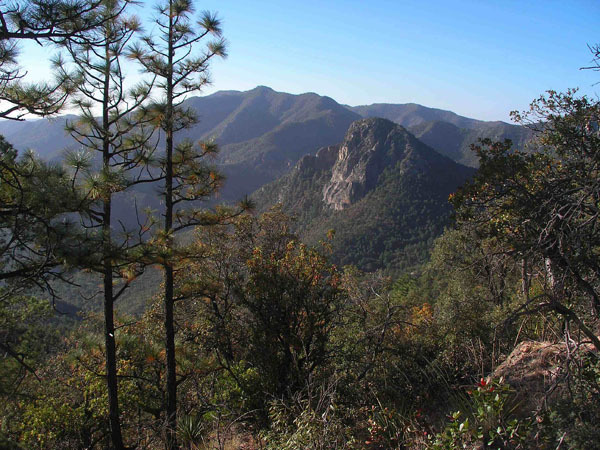 The Sierra El Tigre of northeastern Sonora is a rugged Sky Island mountain range. It covers substantial terrain – its basal area spreads out over 600 square miles. Surrounded by the Rio Bavispe valley on three sides, it is somewhat isolated from neighboring high country, except from the south where it is nearly a peninsular extension from the spine of the Sierra Madre Occidental. The Sierra El Tigre is separated from the Sierra Madre by a pass of rugged hills that rise to around 1,200 to 1,600 meters (INEGI, 1998). The Sierra El Tigre’s altitudinal gradient and rugged topography influence its microclimates, soil types and vegetation, translating to diverse flora and fauna, as well as economic and cultural land use by human settlements (SEMARNAT). Historically, the Sierra El Tigre was one of the last places for Apache resisters to take refuge from a changing region. Apaches used the rugged terrain as protection from Mexican and U.S. Apache hunting parties as late as the 1930’s. Most of the Sierra El Tigre is located within the boundary of the Ajos-Bavispe Reserve, which provides limited protection of the environment.